WASHINGTON (CNS) — Pope Francis has appointed Bishop Edward M. Rice, whose most recent assignment was auxiliary bishop of St. Louis, as head of the Diocese of Springfield-Cape Girardeau, Missouri. The appointment was announced April 26 in Washington by Msgr. Walter Erbi, charge d’affairs at the papal nunciature in the United States. 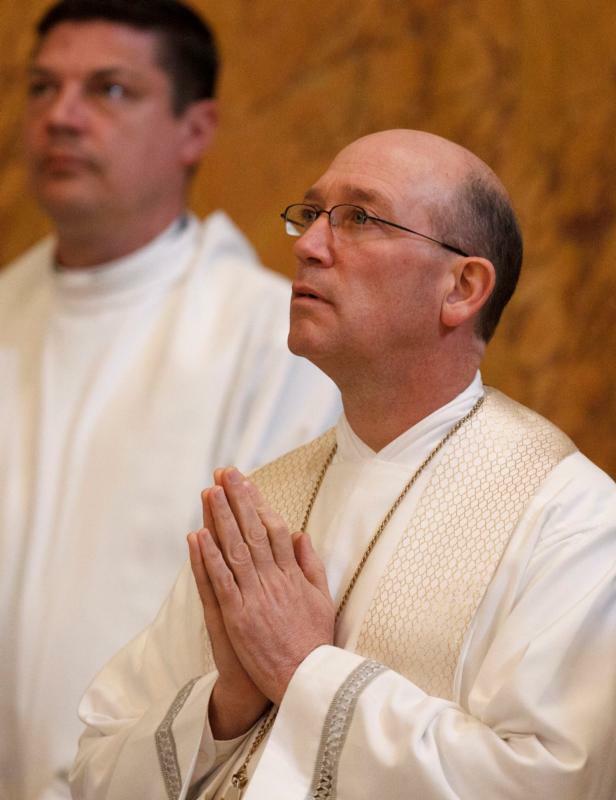 Bishop Rice, 55, has served as an auxiliary bishop of St. Louis since 2010. He succeeds Bishop James V. Johnson, who was appointed bishop of Kansas City-St. Joseph, Missouri, Sept. 15. A native of St. Louis, Bishop Rice was ordained to the priesthood for the archdiocese in 1987. He received the title of monsignor in 2008. Bishop Rice will be installed June 1 at St. Agnes Cathedral in Springfield. A farewell celebration to include a Mass of Thanksgiving and a reception is scheduled for May 23 at the Cathedral Basilica of St. Louis. Bishop Rice told the St. Louis Review, archdiocesan newspaper, that when a Vatican representative called about the appointment, he was praying evening prayer at Holy Redeemer Church in Webster Groves, Missouri, where he lives. “Without hesitation, I said ‘yes,'” he added. Born in St. Louis July 28, 1960, Bishop Rice attended St. Mary High School in St. Louis and studied for the seminary at the archdiocese’s Cardinal Glennon College and Kenrick Seminary. As an auxiliary bishop, he has served as vicar over five of the diocesan deaneries and overseen many archdiocesan ministries, among them vocations, consecrated life, intercultural and interreligious affairs, priest personnel, child and youth protection and the St. Charles Lwanga Center. The Springfield-Cape Girardeau Diocese has nearly 66,000 Catholics in 66 parishes across 39 counties of southern Missouri. “The roots of Catholicism run deep here in the 39 counties of southern Missouri, and I am excited to partner with my brother priests in spreading the beauty of our Catholic faith in the spirit of the new evangelization,” Bishop Rice said in a statement released April 26 by the Springfield-Cape Girardeau Diocese.